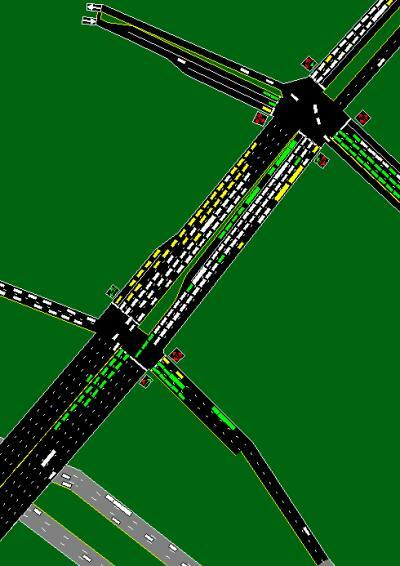 "Oh What Fun, it is to drive…"
In case you’re new to me or this blog, I am a traffic engineer. Better yet, I’m a certified traffic engineer: a Pee-Toe (PTOE, Professional Traffic Operations Engineer). This involves doing several different things like studying how new construction will effect affect existing traffic patterns. Typically, we look at the current year, whatever year the construction will occur, than then some arbitrary horizon year, like 20 years out. Argh. What a mess. Methinks I need to work on how the signals are timed at the intersections you see. This entry was posted in Professional, Transportation. Bookmark the permalink. 3 Responses to "Oh What Fun, it is to drive…"
I’m cursing you just looking at that traffic! Which year projection is that? 2028 with the improvements (you should see the No-build condition). And really, I didn’t look too hard for bad case stuff. This just popped out at me. I want this particular modeling program. I think it would be fun to play SimHighway.